“Magic Carpet:” Not be confused with a Disney innovation, the Magic Carpet is a deck the size of a tennis court that suspends off the edge of the ship. It glides up the side of the ship with four stopping points that will serve different purposes at different times of the day. 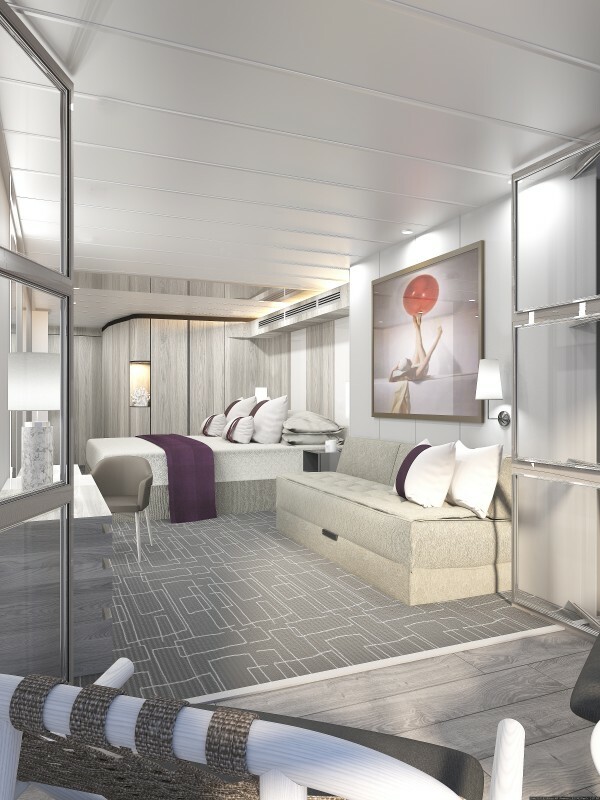 At its lowest level, it will connect to the Destination Gateway, a gathering area with large screen LCD displays of ports of call. When not in use for tendering, the area becomes a learning and activities center for enrichment lectures, shopping events, “game-on” evenings and art auctions. 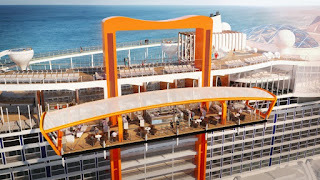 On Deck 5, it extends one of the ship’s specialty restaurants creating al fresco dining. 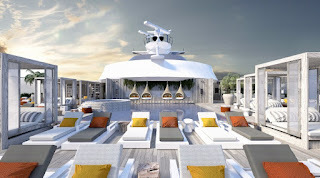 Up on Deck 14, it’s an extension to the pool area, a great spot for a DJ. Other evenings the Magic Carpet will anchor at Deck 16 where it’ll become a fine dining restaurant that's cantilevered over the sea. I can’t think of a more romantic spot for dinner! 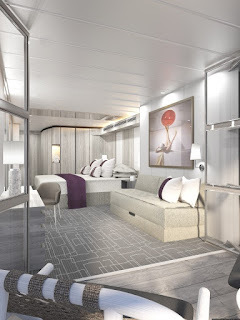 marvelously sumptuous accommodations) is a ship within a ship concept that is becoming very popular on several cruise lines. It includes the Retreat Sundeck with a pool, hot tub, pool bar and cabanas. The Retreat Lounge is an exclusive room serving complimentary beverages and appetizers. And then there’s Luminae, a restaurant offering suite guests a deliciously exclusive dining experience. Garden, landscaped with lots of greenery and modern tree sculptures, will be a unique space at the top of the ship that’s perfect for sunbathing, picnicking and other activities. 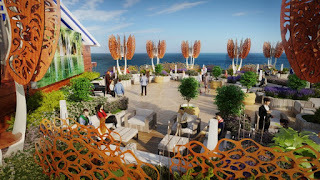 The Rooftop Garden Grill will also be located here and it will offer gourmet burgers during the day and a BBQ at night. We look forward to sharing further reveals with you as soon as they’re made available. 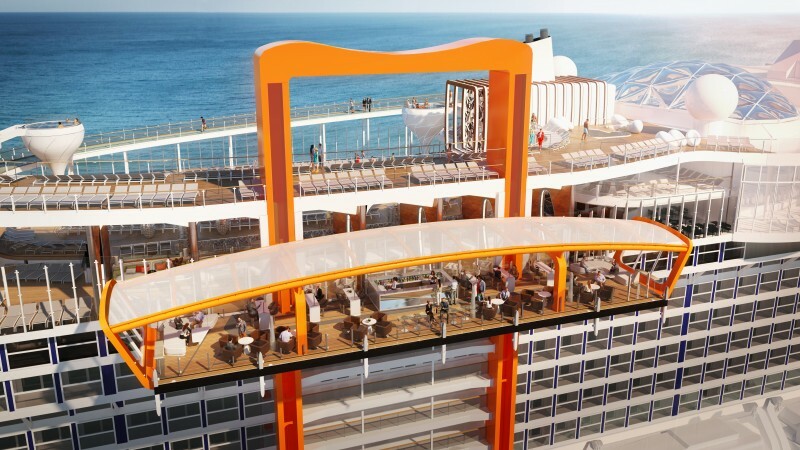 If you already know that you’d like to see this amazing ship for yourself, the first ship in this class, 2,900-passenger Celebrity Edge, will launch December 16, 2018. You can now book reservations on its inaugural season, sailing from Port Everglades, Florida on Eastern and Western Caribbean itineraries.